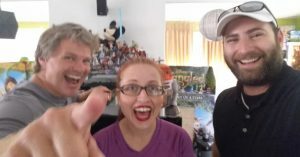 Having been on the podcast “Skywalking Through Neverland” previously, I was invited back by the hosts to discuss a recent Star Wars book. Moreover, I have been appointed as the book guy for them! In the current episode, you can find me discussing “Tales From a Galaxy Far, Far Away: Aliens, Volume I” from 1:38:30 – 1:55:00. I was also invited to write up a post on their website a brief review of the book, in addition to the discussion.